A collection of accentual flourishes gorgeously elevates the silhouette of this white oval beveled wall mirror. Enhance an elegant home retreat with this oval wall mirror from Cooper Classics. 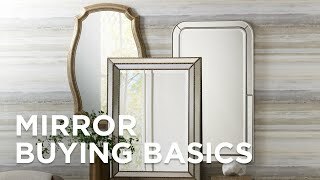 A glossy white finish bamboo-inspired trim beautifully frames this beveled mirror. Sophisticated decorative flourishes charmingly elevate this framework. 24" wide x 36" high x 1" deep. Hang weight is 7.5 lbs. Glass only section is 15 1/2" wide x 24" high. Transitional oval wall mirror from the Cooper Classics Jackie collection. Glossy white finish. MDF wood, polyurethane and glass construction. Beveled mirror. Created with elegant curvesthis vertical silver finish wall mirror features a beveled glass perimeter for added depth and sparkle. Hatteras Driftwood Gray Wash 30" x 41 1/2"
Rustic and charmingthis decorative wall mirror features a driftwood gray wash finish with an inner rope border detail.